Here at Lumber Jack and Jill, it’s our goal to make your landscape and your trees pristine and picturesque. That’s why we provide a suite of professional tree care services. From tree felling to tree maintenance, you can count on us as your local, Northern Colorado based tree care company. Among our other tree care services, we also offer tree trimming and pruning services. So let’s talk trimming. What is the importance of tree trimming and pruning? Why Trim & Prune Your Trees? Tree trimming isn’t just to improve the aesthetic of your trees. While tree trimming can improve the shape and beauty of your trees, it’s also useful to improve the health of the tree itself. Pruning can be employed to remove unhealthy branches, overgrown branches, and branches that are hindering the growth of other branches. With proper pruning, trees actually grow healthier. Think about it this way: A tree has to pull nutrients and water through its roots, (in addition to capturing carbon dioxide from the air). These nutrients and hydration are dispersed throughout the tree, including to dying branches, overgrown branches, and branches that are hindering each other’s’ growth. When we prune trees, there are more nutrients and hydration available to the existing branches. Tree trimming may also improve the safety of your tree. If you have a tree that is growing near power lines, for instance, you’ll need to prune the branches that are encroaching on those lines. You may also have dead branches that are still attached to the trunk of your tree. These branches are liable to fall and injure passersby, or they may damage your property (e.g. your car or your home). Tree trimming also boosts the value of your home. If you’re placing your home on the market, consider giving your trees and overhaul with a healthy trim. We can work with you to decide which trees need the most trimming to improve the beauty of your property, and we can take the view from your property into consideration. For example, you might want to regain your view of Long’s Peak that you used to enjoy from your patio. We can trim a healthy amount of branches to regain that view. Here at Lumber Jack & Jill, we do things a bit differently. We strive to provide the best tree care services available in Colorado, through our education, experience, care, and professionalism. 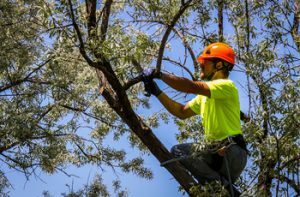 Our team is headed by local Front Range residents, who are educated on in various tree care practices, so you know that your services are top notch. Lumber Jack & Jill Tree Service has been around for more than a decade—so you can rest assured that our team has the experience necessary to safely tend to your trees. With every job, we strive to provide the utmost in safety and quality, because we truly care about our customers and their trees. We always see projects through from start until finish, including cleanup, because we are professional tree care providers and arborists. If you’re still on the fence about our tree care services, don’t just take our word; check out our client testimonials! And get in touch with us if you have any questions or if you’re ready to get a free quote!